Having three children, two of which are boys who are constantly on the move and constantly hungry, we go through a fair amount of food. I am always on the look out for the best value for money rather than the quickest option. I used to do a fair amount of my supermarketing shopping online, but found that shopping at Aldi I was saving between £50-£80 per month. We are lucky we have a great Aldi shop in our local town and one that has lots of lovely Scottish products too. I love that they are local to us from Scottish strawberries to Scottish smoked salmon is a firm favourite of my oldest boy Lucas and I. A few weekends a go we did a shop together and got lots of our favourites. Gone are the days of shopping at Aldi and being worried I couldn’t get everything I needed and would have to make a trip to another supermarket. They sell wonderfully fresh fruit and vegetables, a great selection of meat, fish and dairy. I got a few fresh ready meals for my husband and I on the days I’m at work and he is out coaching. Not just food items, but kitchen roll, cleaning products and even food for the kitten. As you can see I got a whole trolley full. 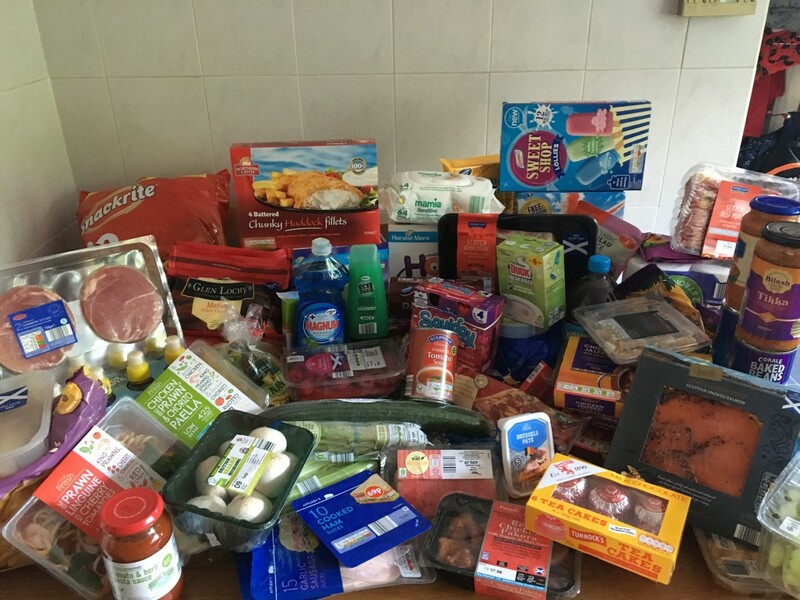 Check out our Aldi haul! Everything you could want in your shop. There are a few treats there, our yummy Tunnocks Tea Cakes and these Sweet Shop Ice lollies are delicious. Aldi has a great range of well known brands to products we love at a great price. We got all this for under £100. There is no way I could do that at another supermarket. Aldi Scotland have their own Aldi Scotland Facebook Page now, which allows us to keep an eye on local offers. With the great range of ingredients Tyler wanted to make something a little different for our Sunday dinner. 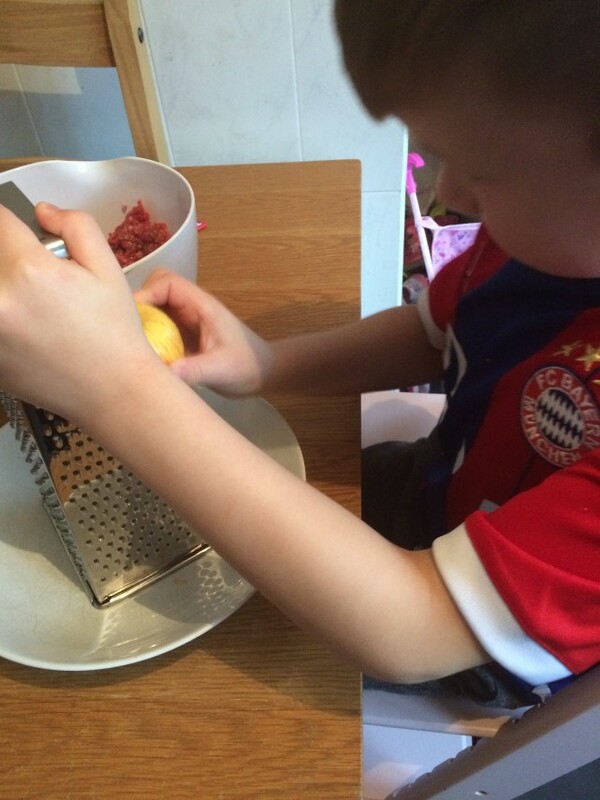 We made some healthy burgers with apple. We thought we’d share our recipe with you. 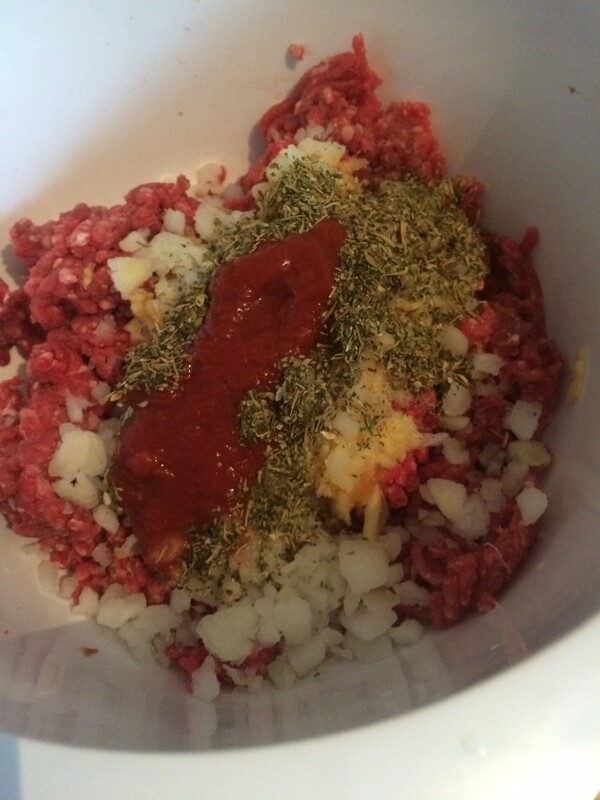 In a mixing bowl, combine the mince, onion, garlic, mixed herbs, tomato sauce, salt, pepper and apple. Add the beaten egg into the bowl and mix well with your hands. 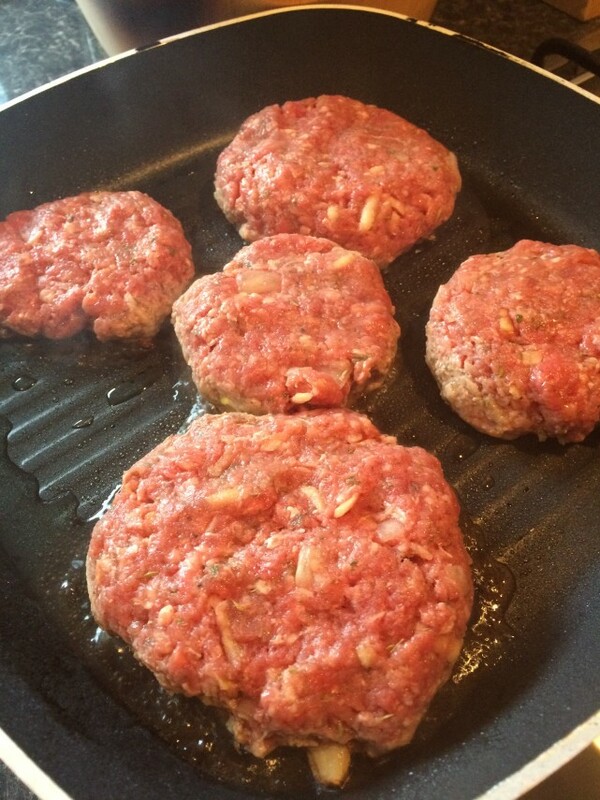 Form small round burgers and place on a plate. Get an adult to heat 1 tblsp of vegetable oil in a griddle pan. Fry the burgers for about 3-4 minutes each side or until browned and cooked through. 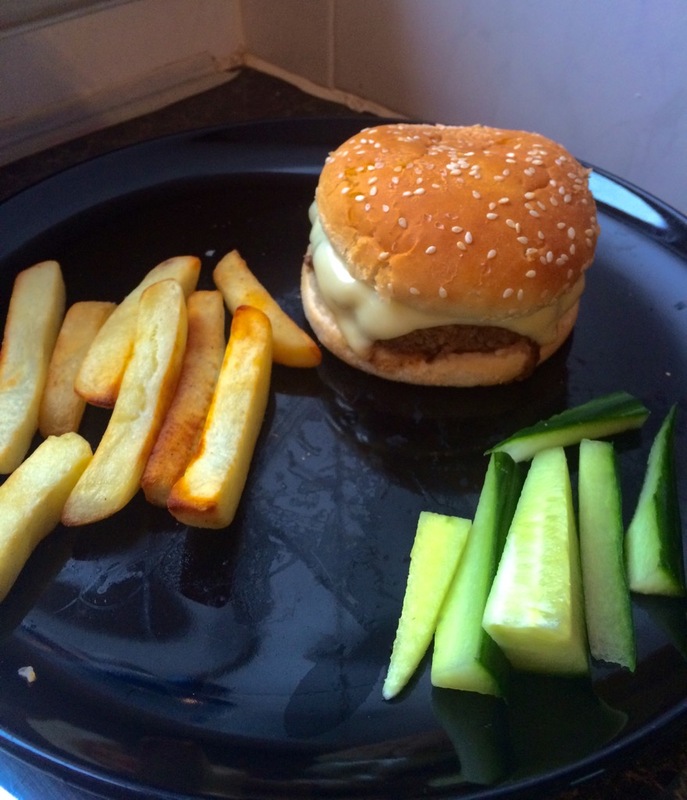 Once cooked you can sever on a burger bun or a gluten free roll, a cheese slice is optional. We served with cucumber chips and some oven chips. It’s up to you what you like with your burger. All three of my children love cucumber with everything. Let me know what you think if you give these a go and what you’d serve with your burgers? I think Tyler did a great job. I have to say I am very impressed with Aldi, there is no compromise on the quality of the products over the price tag. We will definitely shop there more. We got to try a few different products that we wouldn’t have before and you don’t mind getting a few treats when you are saving money. Have you shopped in Aldi? What are your must by products from there? 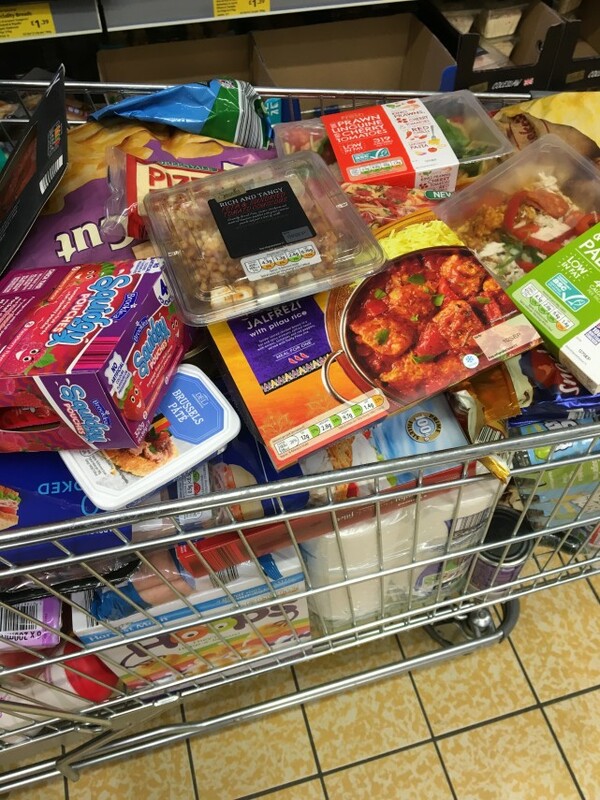 Disclosure:- I was sent Aldi vouchers in return for writing this post, but opinions are my own and I happy to tell how impressed I was. The burgers look amazing! Well done Tyler! I love Aldi it just keeps on getting better and better. I shop there a lot these days! It’s amazing what you can buy at Aldi for under £100. I normally spend around £70-£80 for the 4 of us and manage to get a whole weeks worth of shopping for that including snacks etc. I went to another super market at the weekend for a nosey and ended up £60 lighter with only 4 bags to show for it!! Def sticking to Aldi from now on. I do like Aldi but ours is quite small and to be honest I still have to go to another supermarket because of fussy kids.